Tip o’ the hat to Hill & Knowlton Global Technology Practice Director Josh Reynolds (bio, blog) for getting the ball rolling on how to approach the Hype Cycle. I met Josh early summer 2007 at Buck’s of Woodside (famed and quirky Silicon Valley hangout for venture capitalists and digerati) to discuss his ideas for influencing the Hype Cycle. Josh’s ideas were quite provocative and no doubt he can see a bit of their DNA in this piece of SageContentTM. I have not seen how Josh evolved his ideas into best practices, but perhaps he will post them on the H&K ARcade AR blog sometime in the near future. 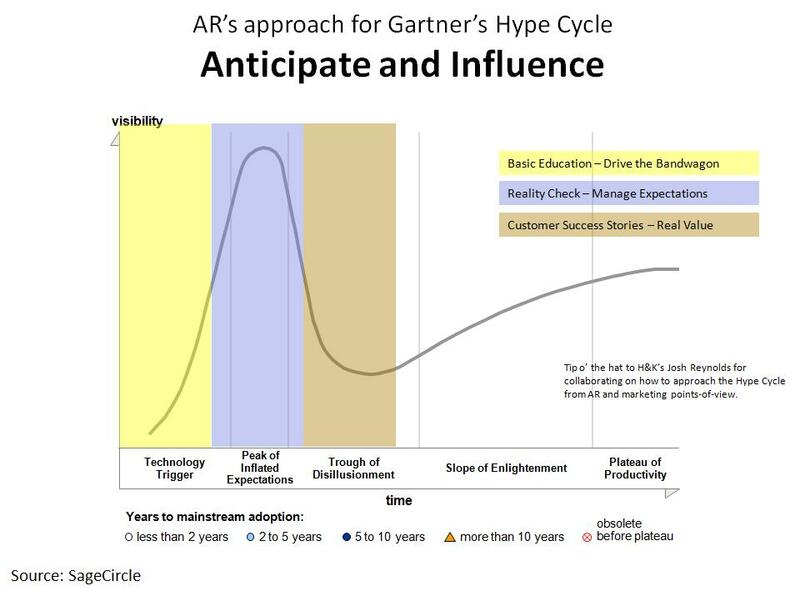 As we mentioned in Thinking about Gartner’s Hype Cycle, the Hype Cycle is the most read piece of Gartner signature research by its clients, but it is often ignored by the vendor community because it does not directly rate vendors’ products or impact today’s sales opportunities. However, this is shortsighted as the Hype Cycle is influential on future IT strategies and budgets. As a consequence, vendors should be investing time into the Hype Cycle today in order to have an impact two to three years down the road. There are three broad categories that AR teams have to work on: flattening the curve, speeding progress, and ensuring that their company is considered an exemplar for a particular technology, service, or technique on a Hype Cycle. This post will focus on the first category. Flattening the Curve – One problem that vendors face when a technology or service is mentioned on one of the Hype Cycles is that the Peak of Inflated Expectations can get so high that there is a backlash. This can completely derail a promising market before it has a chance to get down to and through the Trough of Disillusionment. In addition, a market can wallow in the Trough for much longer than need be, which of course negatively impacts vendor revenue streams. The answer to both problems is to flatten the curve, i.e., keep the Peak from getting too high and the Trough from getting too low. In order to flatten the curve, vendors need to step back and look at the Hype Cycle differently. Rather than focus on the five named points (i.e., Trigger, Peak, Trough, Slope and Plateau), AR should be planning to change perception at the mid-points (click on the graphic to enlarge). The first section then is Basic Education, where the vendor works to trigger the inclusion of its product/service/technique onto the appropriate Hype Cycle. They must educate the analysts about its potential and where it fits into the market trends. Early on, there is a certain amount of priming the pump to get initial momentum. Once the analysts understand the basic capabilities of the P/S/T and are starting to be a bit too enthusiastic about it, the campaign switches. Now we are at the Reality Check phase at about half way up the initial curve. During this phase, AR is working to dampen excessive exuberance by narrowing the application of the P/S/T to a realistic set of applications and playing up the natural growing pains associated with a new P/S/T. Just past the Peak, AR then switches to the Customer Success Story phase where the goal is to demonstrate real business value of the P/S/T when applied appropriately. The goal during this phase is to show how potential customers can obtain success if they are realistic about the strengths and weaknesses of the P/S/T. Role of Competitors as Collaborators – There is one resource that probably does not come to mind when you are planning a Hype Cycle campaign – your competitors. Yes, there is natural tension between your company and other vendors that you wish to vanquish over the long run. However, it is in the best interest of all vendors to flatten the curve. This can accomplished through collaborating on how and when to communicate with the analysts. The more vendors that are talking to the analysts at the inflection points outlined above, and providing as many customer success stories as practical, the faster the P/S/T will slide through the Hype Cycle. When it hits the Slope of Enlightenment, then all the vendors can return to the normal competitive behavior. Bottom Line: Vendors can benefit if they work to influence the passage of their product, service or technique through the Hype Cycle. The key success factor is to flatten the curve by concentrating on the inflection points. Question: AR teams – Have you ever tried to partner with a competitor in educating the analysts? Interesting post, I haven’t seen this before. Thanks for the resource link – may post something related to this and link back from my site.